We don't need Mother's Day. There, I said it - now it's out there. Scream and yell and send me hate mail if you must (please don't), but deep down you know it's true. Our kids shower us with love and attention and tokens of gratitude every single day, and yet we have the nerve to want a whole day dedicated just to us? Okay, maybe I'm being a little sarcastic (Who, me?) - I made this Brite at Britely.com to help explain. Click below to see the little slide show. Just refer back to this Brite if you find yourself feeling the all-too-common Mother's Day Let-Down on Sunday night. If you wait all day for your years of sacrifice, boo-boo kissing, sleeplessness, and unconditional love to be acknowledged, only to find a sink full of dishes, bags under your eyes, and an aching back as your reward - try to convince yourself that deep down, they really are grateful. Even if they don't seem to show it. They just have to be grateful, right?!? And to you Fathers out there, OBVIOUSLY I'm kidding. We do need Mother's Day. It's on Sunday - write it down. And more importantly, you need Mother's Day, to show the hard working, beautiful, dedicated mother of your children how much you love and appreciate her. But only if you want to live to see Monday. If you need some ideas for gifts she'd like from yourself and/or the kids (yes, the kids, too - it's your responsibility to help make it look like they gave this some thought), I've got your back with another Brite so at least you'll know what her expectations are. Click below to read all about it (but click gently - that's Maddie's little squishy newborn face on the cover). 1 click below = 1 vote! Now that you've given me my Mother's Day gift, go orchestrate an incredibly elaborate celebration for the awesome mama in your life! If you ARE that awesome mama, then just sit back and wait for fabulousness to shower down on you. Oh wait, if you're a mama, that probably isn't "fabulousness" showering down on you. Eww. Back to reality - better go get the mop. I love my little ones and they are both still young and hug and kiss me all the time. Mother's Day with them is almost every day. 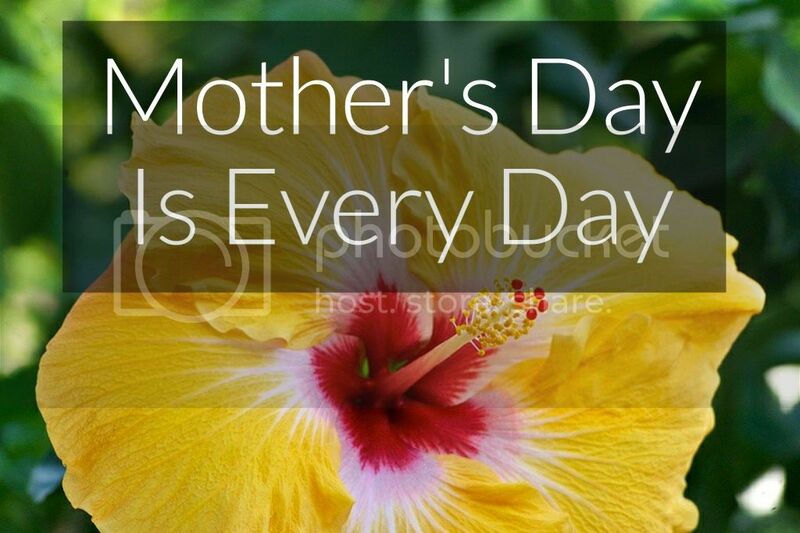 It's nice having a special day set aside for us moms, however. I hope you enjoy your day, my friend! The cards always get my mom, too, though every year we try to agree not to get/make each other anything. Usually one of us ends up doing "a little something" anyway, but really it's more about spending time together (or at least that's what she tells me, which is the same line I feed my own kids). We need the holiday...so the men in our lives get it. Ha ha! ;) Yet so many men understand Mother's Day to be filled with family togetherness, while Father's Day is filled with fishing and golf. What gives? I am taking my mom to a casino buffet, 'cause that's what she wanted to do. It's kind of my idea of the worst nightmare ever. But I will do it with a smile 'cause I appreciate her. Have a happy mommy's day! Thank you! Mmmm, dirty money and bulk food... Actually, the last time I went to a casino buffet it was de-lish-us, so your comment made my stomach growl. But that's great that you're doing it for your mom's sake despite the fact that you're not too keen on it - I hope my mom doesn't ask to go to Chuck-E-Cheese. Oh, I love her squishy face! Happy Mother's Day. May it be chocolatey! I know, babies are pretty cute (but is it wrong that, one year later, I still sometimes see her early photos and all I can think is OOOOOOOUUUUUUUUCCHHH?!???!). You and Maddie are precious. I'm with Ninja Mom. I love the babies, but the last thing I need is another 5 year old. Ha! That's true, they haven't yet come up with a way to recycle 5 year olds so you can trade them in for a fresh baby... Somebody should really get on that. Don't worry, you can always grasp and older child's face and smoosh all their features together - squint your eyes and make them drink out of a sippy cup, and you can relive the squishy baby face days. But only briefly; my kids can only go about 5 seconds without asking to watch TV, which sort of ruins the babyface illusion. 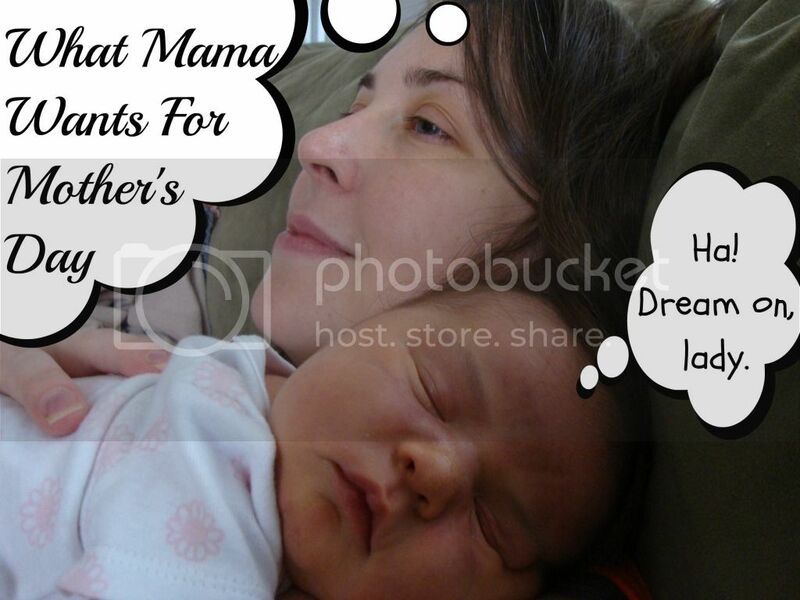 If I could just have a nap on Mother's Day. You know, the kind that's not interrupted, and that lasts as long as you want it to? OHMYGOD that would be amazing. Wouldn't it?!? Such a simple request, yet the odds of our dream being fulfilled are so low... Even if someone told you to go take a nap, once you're a mom there's always part of your brain tuned in to monitor what your kids are doing, so you can never REALLY relax. I think they implant some sort of non-relaxation chip in your head at the hospital while you're all distracted by what's going on at the other end. Sneaky.